From my practical observations and investigations, I have come to conclude that the deliberate or inadvertent failure to enforce laws in the country is the root cause, or the major propellant, of all the visibly abundant and ramifications of corruptions in Ghana. It is not that Ghana has not more than sufficient laws in place to deal with every committed acts of corruption and other criminal malpractices, but it is simply that the laws are not enforced as they should. I shall sooner be highlighting on instances where the laws have been broken but the victims feel helpless dealing with the situation. It really gets to me when I hear people say, “What can I do? There is nothing I can do because here in Ghana, should I pursue this case, it will go nowhere. This is because their boss I should report him/her to is corrupt; the judges are corrupt etc. Therefore, it is a waste of time to make any attempt to report them”. Reasoning from this, they let go any illegal action or acts of corruption inflicted on them by the perpetrators who may comparatively be in positions of power e.g. a police officer, a court clerk or registrar. It is not that there are no laws in place to deal with such illegal actions as a police officer vividly extorting all categories of drivers on Ghana roads; court registrars collusively removing vital documents from case files or criminally hiding evidential documents away, with intent to twist justice in favour of whoever has paid them to do that. There are laws in place to deal with such misconducts but the unobstructed effective application of such laws is the problem. For how long are we going to sit down with arms folded around our chest doing nothing when the very people employed to enforce the laws of the land for the benefit of all are themselves breaching same laws with impunity? For how long are we going to sit on the fence when our court registrars, bailiffs and court clerks are neck-deep involved in infractions of the court rules to either intentionally delay the hearing of, and ruling on, court cases, or to twist justice in favour of the otherwise guilty party but who is able to bribe them? Let me cite a few case instances to home in my argument. Not long ago, a certain Kristo Asafo Church pastor in Kumawu who is said to be short-tempered, a quality unbefitting of a man of God, and at the same time a taxi driver, smacked his passenger that he forced out of his taxi across the chest with a huge spanner. He claimed the passenger, the son of one Mr Asumadu, a member of my Agona clan that I address as uncle because of his old age, and one Madam Akua Donkor, my senior at Kumawu Local Authority School in the 1970 but who has now lost her eyesight hence restricted to her home, had kicked against his taxi when he forced him out of it. This young man of forty years died within hours from the injuries sustained from the spanner. From what I learnt when holidaying in Ghana recently, the driver was not remanded to any prison term let alone, facing prosecution and possible conviction for manslaughter. Many a Kumawuman person believes that it is because the Kristo Asafo Church headed by Dr Apostle Kwadwo Sarfo is rich and might have influenced the case in a way or the other in favour of the driver. I cannot tell if anything of the sort had happened but why has the driver not been arraigned and sentenced or set free? 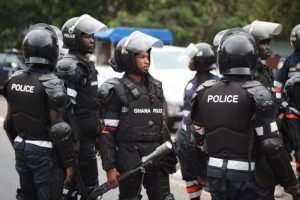 It is an open secret that the police officers in Ghana, especially the MTTU (Motor and Transport Union) police personnel are extorting the drivers on the roads everyday. The Inspector General of Police cannot tell me that he is not aware of this. The Accra Police spokesperson, Afia Tinga, who is on my WhatsApp contact cannot tell me that she is not aware of this. What are they doing about it? If a law enforcement agent turns around to infringe the very laws they are to protect and enforce, where is the nation heading towards? If our court registrars, lawyers and judges engage in nefarious activities to twist justice in favour of the highest bidder, where is the nation heading towards? Are such irresponsible acts not recipes for civil uprisings and or fatal military interventions in the administration of a nation? I have published an open petition for the attention of the Inspector General of Police, Mr David Asante-Apeatu, regarding the MTTU police personnel always mounting police checks of vehicles plying that stretch of road between Ejisu-Krapa and Kwamo on the Accra to Kumasi highway. They are there only to extort the drivers but nothing else. Are they not paid at the end of the month? Why should they then be collecting bribes from the drivers all of the time? I cannot stand that nonsense and open practice of corruption by our very law enforcement agents who should know better and live exemplary lives worthy of emulation. Unless they cease taking bribes, I will want to see them removed from that area or else, I shall escalate this issue further. We are not helping His Excellency Nana Addo Dankwa Akufo-Addo fight corruption if such irresponsible infractions by the police and our court registrars are not reported for appropriate actions to be taken against them. Such people breaking the laws must be fired and replaced! They should not be allowed to continue to keep their job. Many unemployed people are out there looking for jobs. Why can’t we make use of them when those grossly misconducting themselves as the police officers openly shamelessly taking bribes are caught and/or sacked? What stops the government from expelling from the police force and the judicial service those found to be abusing their powers and trust invested in them through extortion and acceptance of bribes?